In the 18th century the cruel Penal Laws were passed in Ireland. Priests and bishops were not allowed to say mass. 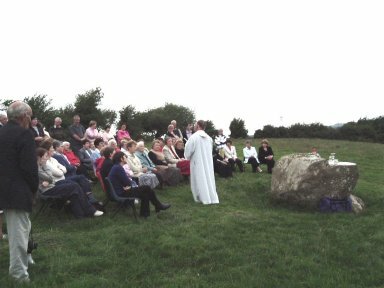 The people gathered together in the open at mass rocks or in safe houses. Some fields in Ireland have the name "Carraig an Aifrinn" or Mass Rock. In parts of Ireland today, especially Kerry and Cork a mass in the house is still celebrated.This is called a "Station Mass" and goes back to Penal times. One of these mass rocks is in our parish at Killesk. The rock is made from granite which is a very hard rock. 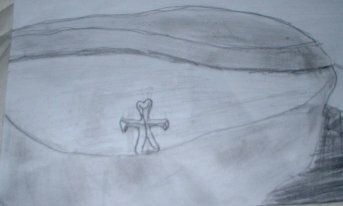 A section on top was cut away to make a flat altar for the priest to rest his vessels.There is a cross carved on the rock's flat surface also. The mass rock field is away from the roads and well sheltered with trees. Lookouts were posted in case the soldiers or Red Coats were coming. Mass was held in secret and the priest arrived in disguise to say mass. Mass rocks were often placed near streams so it is possible that people walked on the bed of the Pill so that they would not leave any footprints behind. The soldiers from Duncannon found the rock and rolled into the nearby river Pill. Campile or Ceann Phuill means the "head" of the Pill. The rock stayed there for over 200 years. In 1973 it was put back on its base. Some locals wanted it placed in the village but the owner of the field, Janie Colfer, had it placed back in its original position. It is there to this day and mass is said each year on the Monday nearest the feast of St.James. Our parish church in Horeswood is dedicated to St.James. The first mass was said there in 1974 by Canon Anglim P.P. Horeswood. Penal cross used by priests with its short arms so that it could be quickly hidden up his sleeve. The custom of placing a lighted candle on the window at Christmas is also said to come from Penal times. It was a signal to the wandering priest that it was a safe house to visit and that the family wanted to receive the sacraments. After the Penal Laws the custom continued but the candle was now used to show the Holy Family the road to Bethlehem and as a welcome to Baby Jesus into the home. The custom is still carried on in many parts of Ireland to this day at Christmas.